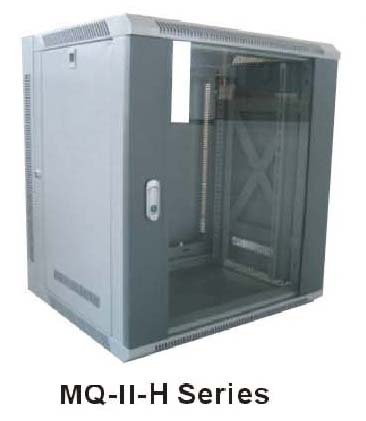 Cabinet manufacturers, Cabinet exporters, Cabinet suppliers, Cabinet OEM service. It can used to assemble any kind of 19 FT networks, communication products. Two installing ways: hanging on the wall and stand on the floor. Material: Full frame is formed from good quality C.R.S 0.9mm-1.2mm thick.International popular Grey color, and phosphate treatment for rust prevention, electrostatic powder spraying. 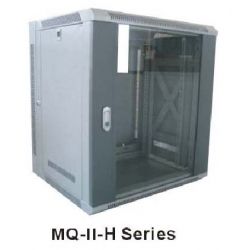 MQ-II-H series products have unique design-full ventilation rear cover, it could be locked free, open and close in 180 degree omniorientation, it is convenient for examining and repairing for inner equipment.